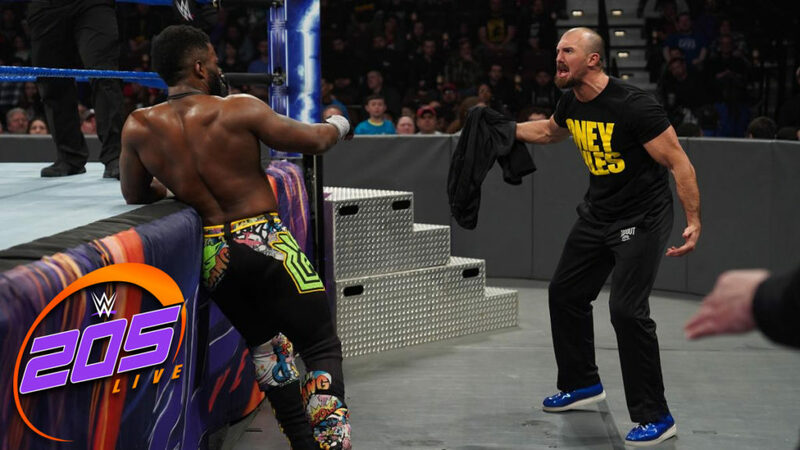 Last week, Tony Nese defeated Cedric Alexander and qualified to face Buddy Murphy for the Cruiserweight Title at Wrestlemania. Also last week, Buddy Murphy attacked Tony Nese after his match. Good match. The big story here was how Gulak and Gallagher could work with Carrillo. Carrillo started the match (in a nice opening with Gran Metalik), but Gulak got Carrillo out of the ring because he wasn’t happy with the flying Carrillo was doing. Most of the rest of the match was fought with Gulak and Gallagher taking turns and Carrillo standing on the apron. Carrillo tagged in later in the match, and Gulak’s disapproval of Carrillo’s style cost their team. This was a good story match, and the action was nice. Kayla Braxton welcomes Maria and Mike Kanellis. Mike and Maria defend how Mike beat Tozawa last week when Drake Maverick walks up. Maverick tells Mike that he is going to have a rematch with Akira Tozawa, and Brian Kendrick will be in Tozawa’s corner. Buddy Murphy says he is at the Performace Center tonight to protect TOny Nese and their Cruiserweight Title match. Murphy says his attack last week wasn’t meant to hurt Nese, it was meant to wake him up. Murphy was showing Nese that he is always ten steps ahead of him. As Murphy talks, Nese attacks Murphy. Some guys pull them apart, and Nese says Murphy was nothing until he brought Murphy in to 205 Live. Good match. This was an interesting matchup between a man who has a lot to prove as he tries to gain some momentum (Daivari) and a man who needs to bounce back after a tough loss (Alexander). While the match was good, the main story here became more about Oney Lorcan. Lorcan sat at ringside during the entire match, and he got directly involved in the finish. The finish wasn’t great (it was predictable and uninspired), but it sets up a good match, so I suppose it’s fine. After the match, Lorcan attacks Alexander. They brawl for a bit before some officials come out to break them up. With Alexander being held back, Lorcan punches him in the face, putting Alexander down. This show definitely felt like it had lower stakes than any of the previous episodes over the last few weeks. The action was good though. I liked Alexander and Daivari, but they could have a better match. The ending hurt it somewhat for me. There were a number of fun moments in the six man tag, so I liked that one more tonight.